The The 1950 Blend was carefully roasted for you by Verve Coffee Roasters. The 1950 Blend’s flavor profile harkens back to the days of old when spice traders collided with new lands and coffee shipped on boats made of timbers, flying canvas sails. This coffee was grown in the Sidamo region of Ethiopia. These beans were grown by various small producers at an altitude of 1,800 meters. The lots consisted of Ethiopian heirloom varieties. This coffee is balanced and has notes of caramel and baking spices. Very drinkable, smooth. Pretty solid for an everyday cup of coffee, although I would like something with more acidity. I am usually equal opportunity when it comes to Ethiopian beans of any kind, but I was not a fan of this particular blend. I've had other Verve roasts before, but I will not be getting this one again. It's decent as a straight espresso, but doesn't stand up to milk well. I made my typical machiatto and it was drowned out behind the little bit of milk that I put in with it. I'm going to keep playing with the temperature to see if I can dial up the baking spices a bit more, overall it's a decent espresso. Very good and smooth when prepared with a Chemex. I like this coffee ok. I didn't think it had the amount of flavor that the Onyx Sugar Skull did, I thought it tasted a little more flat, and lacked the complexity. Although it wasn't too dark or bitter or anything. Just didn't taste like there was a ton going on. did care for it much. i think i need a bolder coffee. Too mild for my taste. It has been a while since I had this one but I remember it being a treat on Aeropress. Not bold enough. Too heavy on the spices for my taste. Just wasnt a cup of coffee i would want to drink every morning. This was good but I like a little more smokey chocolatey in my coffee flavor like my sumatra dark roast I usually drink. I noticed when I lost track of time I left it in my aeropress too long and it turned slightly sour. Maybe next I can try a mokha java blend? I enjoyed this blend more than I expected to. It had a deeper flavor than I imagined! The coffee is good, but not memorable hence the 3star instead of 4. I usually drink my coffee with a splash of milk, but this coffee didn't seem to do well with that...which I guess is a good thing since I started drinking coffee without milk--a habit of mine for over 10 years now!!! That's something. I don't know if I taste the caramel...it seems tangy to me? I have never written or paid attention to subtleties of taste. So I can't be of much help here...just yet. Smooth and fairly well balanced with hints or peach, brown sugar, and a slightly nutty, acidic finish. Not sure I'd consider this a medium blend as it's fairly light for my tastes. We loved it! Smooth and not the least bit bitter. Just the right strength. I would definitely buy it again but I'm excited to see what's next! :) Because I'm getting such great beans from MistoBox, I bought an electric burr grinder and decided to try making coffee with a Chemex. I think it makes the coffee taste even better! I wanted you to know I'm using the Chemex in case it changes what type of beans you send. :) This is so much fun! I loved this blend. It was just what I needed to commit to mistobox. I would like to continue trying a variety, but this was a winner! The notes of caramel kept it from being too bold but wasn't too sweet like many coffees I've received from other subscriptions. I really enjoyed this one. I've had some single origin Ethopians that were good, but this blend does it just right. It wasn't too fruity and acidic. It makes for a good and well balanced Ethiopian blend. I picked up on some floral and earthy notes, but they weren't overbearing. It also went great with a little milk. Good coffee, like the brightness, but is just a touch too spiced. Also seems to be high in acidity? Good everyday soft and balanced coffee. The smell alone was enough to make me stop half way during the grinding process. Only half the bag was ground. The taste, was not enjoyable, mostly due to the aroma. I never really gave it a chance to re-taste. I just couldn't get past the aroma. We only made one pot of about 5 cups. Neither of us finished our cups. We poured them out, and brewed our normal brew. Wow was that aroma awful. If I had a choice to take a deep breath of this coffee or a deep breath of skunk odor. I choose the skunk. This has barely any flavor; it tasted watery and bland. I'd like something with flavor! Nothing really jumped out of the mix for me. Bit of chocolate and smooth, but nothing too crazy. Coffee was okay but seemed to be lacking any real wow factor. The smell is wonderful, the taste is peculiar. There is a pronounced sourness which I find unpleasant. Perhaps that is what is meant by "fruit", but it was not appreciated. Varying the amount didn't appear to help. Used in French press with coarsely ground beans. Hoping the next will be more palatable. We enjoyed the 1950 blend. It went down smooth and had very pleasant flavors. We would prefer something more robust, but all in all we are pleased. The flavor was a bit too fruity for my taste. The citrus/peach came on too strong. There is a note in this coffee that I absolutely hate! I always call it acid, but maybe its spice? Or floral? Or something else that I'm not naming correctly? I smelled it when I ground it. I sent back a Clover from Starbucks once because of this note (poor barista) and I think it was a coffee from Ethiopia. Tastes exactly as described. Flavorful, non-acidic and fragrant. Completely agree with flavor description above, very strong nutmeg, cinnamon, and clove flavors. The beans vary greatly in size and shape, and probably because of this the roast is varied (some of the smaller beans are much darker than the larger beans). When brewing 4 cups I found that using 4 tbsps. instead of three as suggested in the instructions, gives it more body and flavor. My taste buds are adjusting to freshly ground coffee. They're used to Maxwell house or Folger. Amazing!! I felt like I was in The Great Gatsby! So lively and wildly delicious! For a "blend", I love this coffee. Super sweet and caramel and the baking spices really come out. Great for cold weather. I like coffee on both sides of the spectrum: either the sun-dried type that's real fruit forward, or this type that's balanced and chocolate/caramel sweet. A solid cup of coffee that is balanced and light. The butterscotch/caramel and baking spices definitely come across strong, and it makes the coffee a little heavy for me. It's tasty, and I would get it again, but probably as an after-dinner/dessert coffee vs. a morning wake-up cup. I enjoyed this coffee - it has a very different flavor profile than the first one I received. Pros: bright, spicy - reminds me of how interesting and different coffees can be. Cons: leans sour on my espresso setup, as many light roasts do. Also not quite as full a body as I would ideally like. In the long run I like coffees like this from time to time, but it is not wheelhouse for my espressos. Had my first cup (well two cups) last night. Really liked the taste. Like I said in my initial comments, I usually take my coffee with milk. I tried this coffee without milk though, just to get the full taste and I was very pleased. This coffee almost tastes too good for me to put milk in it. smooth, flavorful but subtle, balanced after taste. Made an easy to drink french press! I liked the balance of this blend. It had a robust and slightly earthy flavor. We enjoyed this coffee very much - perfect amount of boldness. Only change would be to bring down the caramel notes. The buttery taste seemed to overpower the other notes in the coffee. I felt this coffee was too tart. Did not like the fruity flavor. This coffee is very aromatic, but a little weak on flavor/body. It's more like a light roast than a medium. It reminds me of a restaurant coffee served at a brunch. Seems slightly bitter for our taste with a mixed review between my wife and myself. She would give it two stars and did not like the aftertaste. I liked the aroma and I would have given it a 3 1/2. Good nutty flavor - came out a little watery the first brew, the second brew much better. Not too acidic not too bitter. Overall I still like Holler Mountain a bit more - but definitely a good clean brew. Solid medium blend with bright top notes and a full, mellow taste. Not too acidic, not too forceful. Good cup for a leisurely morning. My favorite to date that I have received from MistoBox is the 1950 blend from Verge. This blend was delicious and extremely smooth. The flavors all paired wonderfully together for a great cup of coffee. I really enjoyed this coffee. The aroma especially! I really loved the balance of The flavors. I love the "earthy" notes and sweetness of the blend. I rated this low just because it just wasn't to my taste. It had an aftertaste that I did not like. Reminded me of folgers. I'm sure this is good to many people but I didn't want to give it a high rating because I don't want to get sent another similar. I'm just going to pass it on to a friend or family. I know someone will like this allot. Usually I don't like Ethiopian blends but I do like this one. Actually, I've had it before. It's sweet, has a nice clean finish and there's subtle chocolate notes to discover. I'm not a huge fan of the spices flavor, but it doesn't come across too strong to be a problem. Overall, I like it, but not my favorite. My favorite coffee of all time is the Big Trouble by Counter Culture. I'm sure you've had it before. If not, give it a try if you like full, nutty coffees. I would love to see if you know of anything else similar in flavor to recommend. Great body and flavor notes! This one was a little too bland for me. It seems to be lacking intensity or much flavor at all. This coffee is excellent, and was a great first package to receive. Deep, full flavor that is gratifying black AND with some soymilk in it to cut the acidity. Would have given 5 stars but in an email I received was told that this review is how the Mistobox service continues to curate my selections, and I feel like there wasn't enough information about the coffee included: is it a light roast or dark roast? What does the blend vs single origin mean in terms of flavor? Is the flavor of this coffee typical of other coffees of similar origin/roast/make? In my preferences, I wrote that I'm hoping to use this service to learn the basics of coffee tasting, so at some point over the next six shipments I'm hoping to get packages with info like "This is a classic dark roast" or "in this coffee you'll taste ____ which is the signature of it's region of origin." Not particularly consequential but the blurb also has a typo at the beginning. This was a very well balanced coffee, not too acidic, not to flat. Very strong marshmallow and caramel flavors. I like! A little darker than our preference, but still very good, best as pour-over, something about the way it turned out in french press left a strange after taste. This coffee is good but a little mild. We think it's nicely balanced but would prefer something with more easily identifiable flavor notes. I like the subtle sweetness and the smooth flavor. I now realize how terrible my old coffee was!! One of my favorites. It lacks the acidity of some of the other roasts I've tried and the flavor profile is very caramel-heavy (which I like). I thought this was an average coffee. The tasting notes sounded intriguing, but I couldn't really smell or taste them. Maybe my novice palate isn't sensitive enough to pick them up? Good, but not great for me. This is my first time trying freshly roasted beans. I like the smoothness and aftertaste that you get right after taking a sip. This is really good, but I think I want something a little bolder. It has a terrific, light flavor that doesn't feel over roasted or burnt. It is very smooth. And it is very light. I almost need no cream with it. Has some fruity brightness without being overly acidic. Sweeter overall than some of the other coffees I've received. I've been using this as my regular morning coffee. A new addition to my favorite coffees list......great blend of flavors. I liked this one, but felt the flavors weren't as prominent as I typically like. I have to admit, this is the first time I've gotten whole bean coffee and ground it at home though I've had fresh ground coffee at a friend's house before. This is an amazing coffee, even though I believe I should have brewed it a little stronger. I am an avid tea drinker, and this is the first time I've tasted a coffee comparable to a tea; by which I mean I could actually pick up on the nuances in flavor. It was more than just a cup of coffee, it was an experience. I prepared it in a french press at 80℃ and drank it black. The smell of caramel is rich, and a little nutty as well. The flavor was nutty as well, and I could pick up a variation of spices, but the caramel was rather subtle. I wish I could put my finger on it, but there's something about this that makes me just love it. I brew all my coffee with a pour over and I feel like for once I can actually taste the complexity here. Okay coffee. Not to my preferences. Liked the first batch better. This is a nice coffee and probably a nice pick for medium roast lovers. I like the notes of caramel and baking spices but would appreciate these notes in a bolder coffee such as a dark roast than a medium roast. This offering was my first through the subscription service. I was really looking forward to it. Alas, I'm not terribly impressed. I specified in the survey I was sent that I like coffees with big body, little to no fruit flavors, and roasted to Full City or Full City Plus. This coffee offers none of those. The body is rather thin, though not awful. It is roasted to a solid City or maybe City Plus which brings forward the profiles of the beans which is undeniably peaches. The spice and caramel notes, which sounded appealing to me, are pretty distant. Thing is, this is a good coffee, it just isn't a good coffee for me. I enjoyed the balance and versatility of this coffee. Using a V60, it was very crisp with a nice peachiness that was more pronounced as it cooled. Using a French press brought out more of the spice, caramel, and chocolate flavors. I like that it was versatile, depending on my mood and the fact that I ran out of V60 filters and had to use a French press! Overall, it was very enjoyable, but I think I would enjoy it more in colder months. I tend to enjoy something more fruity in the summer time. Thank you. Delicious and forgiving in an aeropress. Just AMAZING. My favorite so far in the subscription...well-balanced and nuanced. Well done, Verve, well done. A nice medium roast. I've had some good pour overs. Slightly acidic, but I don't mind that as the other flavor profiles seem to balance it out. We love the smell of the beans and the aroma of the brewed coffee! Great Coffee, I have really enjoyed this as a quality medium roast, though my palate prefers dark roast. Decent medium blend, slightly bitter note in chemex. Excellent flavor, though we found it to have a bit more acidic of a flavor than we like. We brewed using both a french press aeropress. Delivers the flavors as promised. Good with creamer or without, strong flavor without much in the way of wateriness or bitterness. Exactly what I'd look for in a medium. It's very good and has a wonderful aroma. I'm very happy with it. I brewed with French Press and it made an excellent cup. Smooth, caramel and nuts flavor. Hint of berry. Not very bitter. Nice smooth, really enjoyed it. Was happy to have received this blend. My new favorite coffee. Not bad. A little more bold than we like but we mixed it with the Dillanis and it brewed nicely. Loving it. Great medium roast. Flavor was unappealing, hard to put my finger on why, it somewhat reminds me of McDonald's coffee and that has never been a favorite of mine. It has grown on me somewhat since starting but I would not pick this flavor again. I'm bummed I didn't love this coffee. 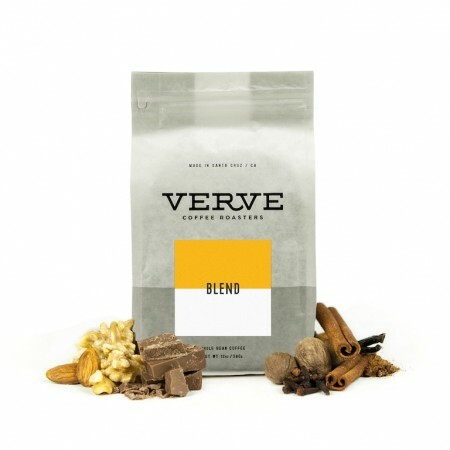 I used to live in Santa Cruz and have heard great things about Verve. Perhaps this just wasn't the right blend/roast for me. It was overwhelmingly nutty to me and I don't know if this is the right word but seemed acidic. Wasn't as rich as I usually prefer it to be. Before I add my coconut milk creamer it tastes much better. It has a bright fruity taste that I like but isn't my preferred kind of coffee. Adding the creamer gives it a metallic taste. It was still drinkable but the flavor tasted off. What came to mind is: earthy, dull, cinnamon. I switched from using an electric grinder to a hand grinder if that makes a difference. nice medium roast with complexity. Loved it! Great flavor and perfect amount of boldness. Would love more like this one! This coffee paired with a little bit of milk made for a very well balanced cup in my opinion. Not very smooth. Bitter aftertaste. What's not to love. A great cup. This was stellar on my Chemex. Deep clove notes and stone fruit acidity made for such a balanced cup. Wow! I have never had a Yirgacheffe I liked until this bag! Good balance. Subtle flavors but diverse. Aroma not great / doesn't reflect taste. All in all very drinkable. Very good with slightest splash of cream. The ground beans smelled delicious, almost like brownies. But the coffee tasted like tea and overripe fruit. After trying this blend with both a chemex and and aeropress, my husband and I decided that we didn't really like this coffee. It had some sour notes that were overpowering. This coffee was great! I use a French press, so I was able to get some more flavor than drip. I love the finish of this coffee. To me it was that sweet taste, like the end of a caramel or butterscotch. This one was delicious. By far our favorite! I love this blend; the subtle hint of baking spices is wonderful. This is a great coffee for anytime of the day! A little acidic and fruity. I normally don't like acidic or fruity coffees, but this one was good. I really liked this - dark roast but not tasting burnt. It had a good mouthfeel. Used it french press and drip and liked it both ways, but the press was really good.